Throughout its long history, established in 1884, Waterman has produced a wide selection of the highest quality pens in a broad range of prices. In 2010, Waterman continues as a major player in the 21st Century pen market, with the creation of the Serenite d’Art Collection, by pushing through the boundaries and producing some of the most beautiful pens in the industry today. The Serenite d’Art Collection, inspired by Water, Air, Earth and Fire, combines the finest materials with the creative vision of a modern artist. The curved bodies, the unique textures, the splendid colors and the breathtaking designs merge into true masterpieces that are extremely pleasing to the eye yet highly functional. How often does that happen in the art world? Gorgeous hues of blue, red, silver and black and the unique designs encompassing Mother Nature at her strongest, is sure to please the ever evolving needs and desires of today’s sophisticated pen collector. 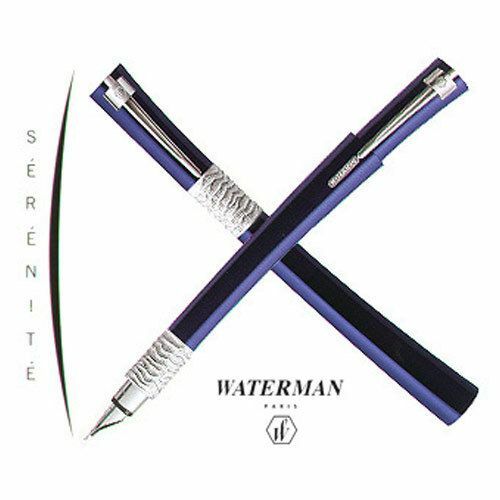 Waterman’s Serenite d’Art has hit the mark, combining art and the art of fine pen making! While the Serenite d’Art Collection is superb, those looking for a more moderate price point, check out the enormously popular Waterman Carene, Perspective and Exception collections. With the same Waterman eye for detail, these collections offer an elegant gift at a much more affordable price. Waterman has changed the face of the modern pen; for a unique gift this holiday season choose Waterman, now available at Executive Essentials!